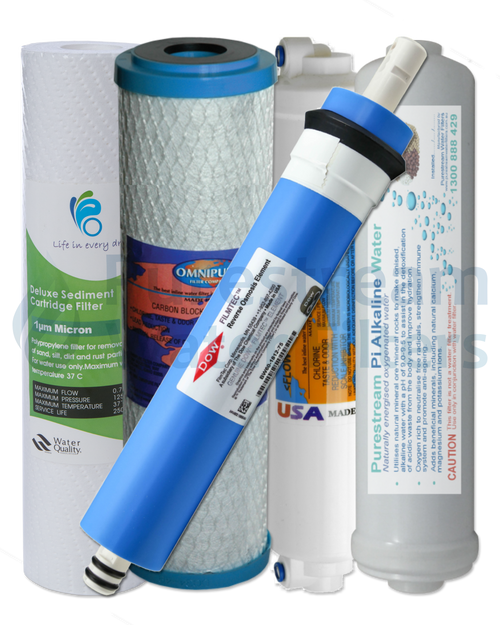 We appreciate that water chemistry can be a little confusing so our change of replacement cartridges is streamlined to make the selection easy – we offer the best available. 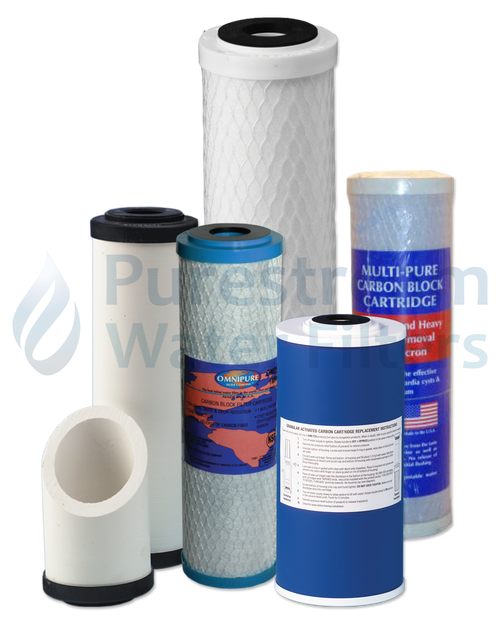 All Purestream replacement cartridges are either Australian, USA or United Kingdom manufactured. 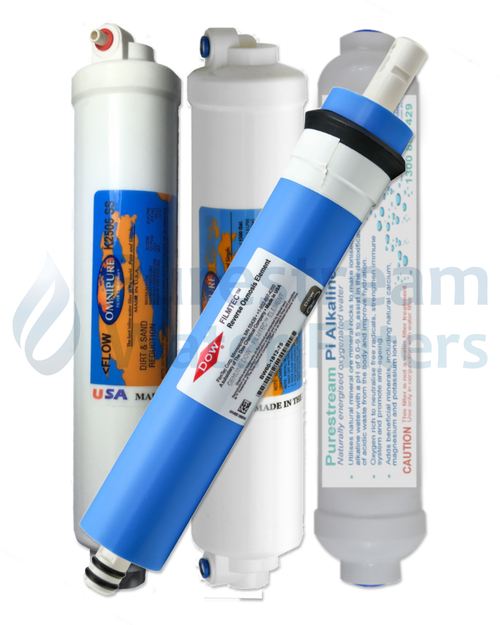 Speciality cartridges are also available, including calcium removal and descaling cartridges. Standard cartridges are what we call 10" high x 2.5" diameter (248mm x 65mm). Purestream also have 9” cartridges available. Some companies choose to market 'non-standard' cartridges to ensure you can only buy replacement cartridges from that company, usually at a more expensive cost. These include spigots on the end, double “O”rings and a variety of other attachments. Standard cartridges are flat with washers at both ends. Some bayonet style cartridges, e.g. 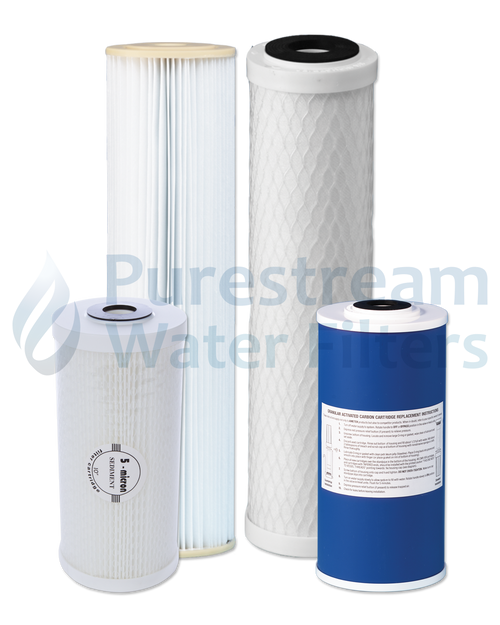 'Q Series' are readily available and cost effective and are included in the Purestream range as they offer ease of cartridge replacement and are very compact. Brands using this non-standard cartridge include, Aquapure, ESP/Raindance, Raindance SS Series and Puratap. 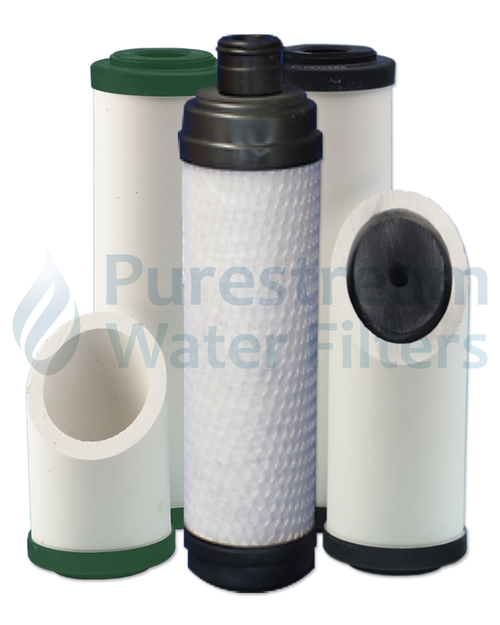 Water filter cartridges have a micron rating which determines their quality and what contaminants they can remove. 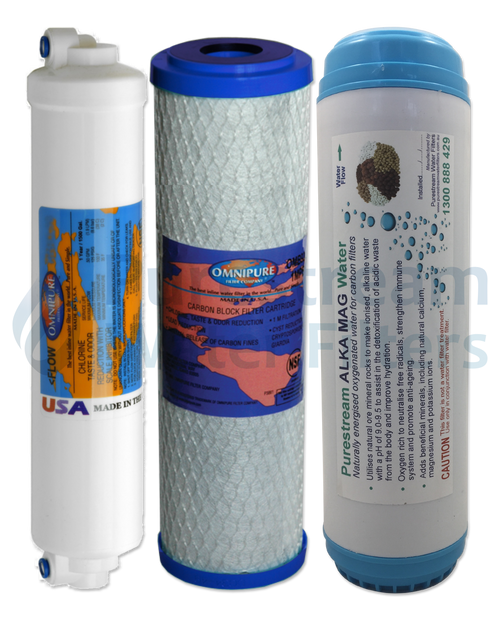 A 5 micron carbon cartridge will remove chlorine, but little else, with a 0.5 micron carbon cartridges, removing all chemicals, lead, giardia and crytosporidum parasies down to a 0.2 micron for the removal of bacteria...the lower number the better. 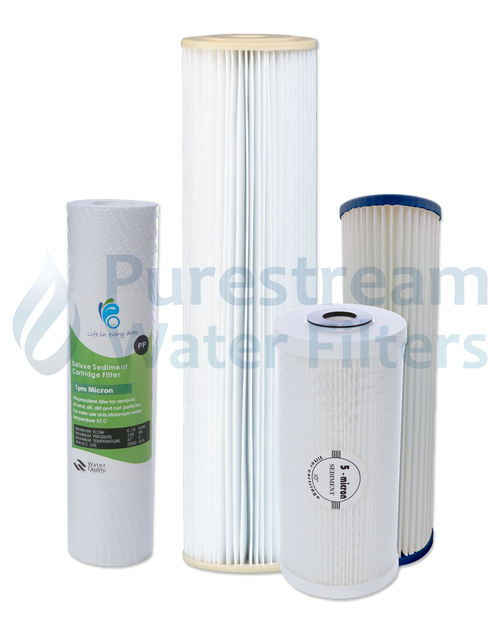 Used as a pre filter in both carbon and reverse osmosis undersink units. These are inexpensive, usually polyspun, and recommended to change every 6 months. This is the case in older homes with sediment in pipes, however most homes need only replace every 12 months. These cartridges play an important role as they remove fine sediment, ensuring carbon cartridges do not get clogged and are able to removal all chemical contaminants. 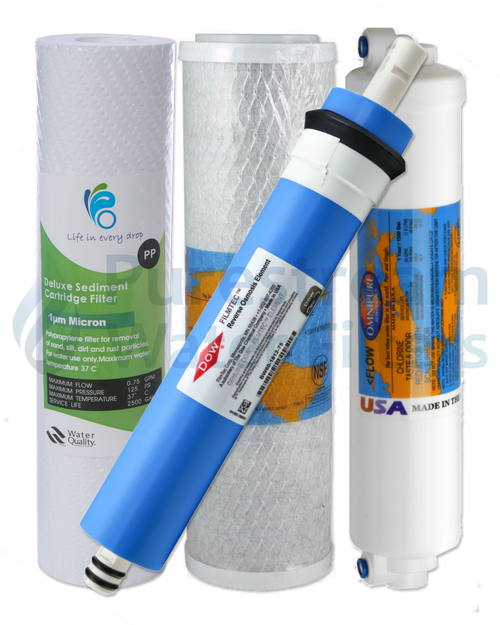 Pleated sediment cartridges are also available when heavy sediment is a concern. Sediment can be washed off the pleats to maintain acceptable flow rate over the 12 months. 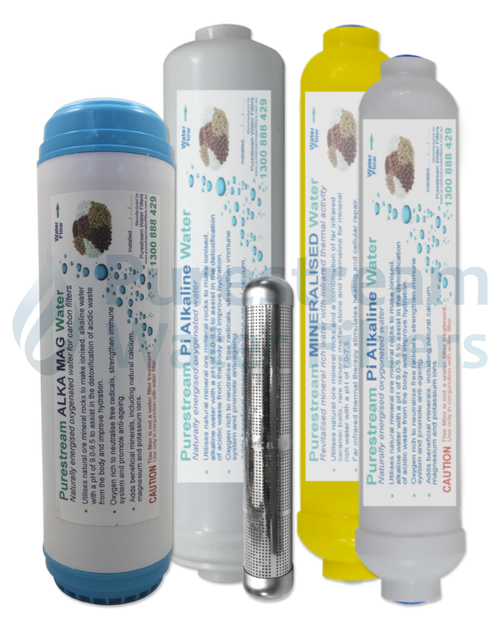 These cartridges are the main component of any system and make the difference in the quality of the water. 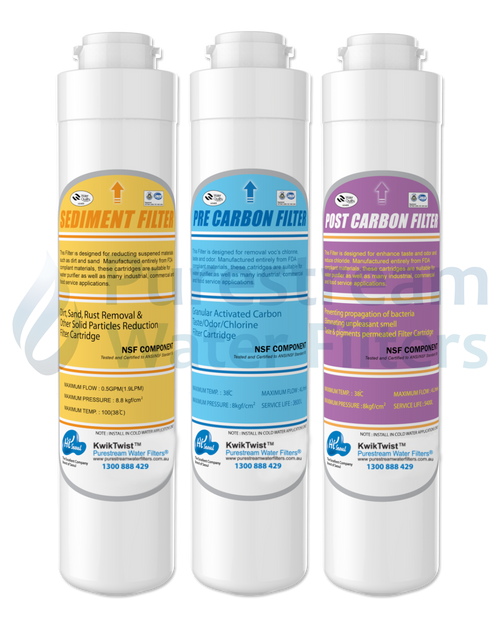 We recommend a minimum of 0.5 micron rating for all carbon filtration to ensure all chemicals, pesticides as well as parasites and lead are removed. 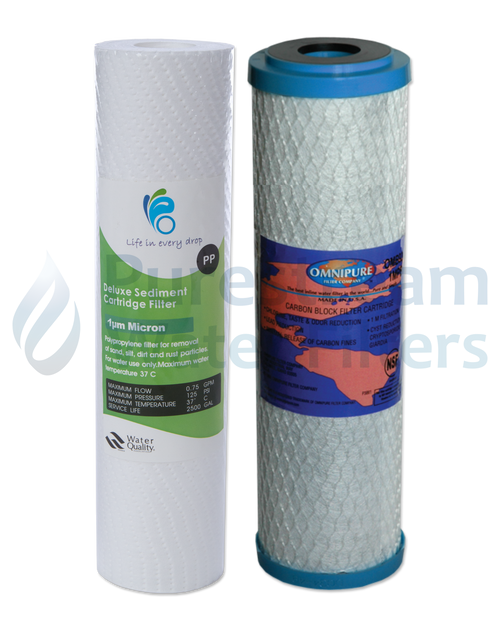 A 5 micron carbon filter is recommended as a pre filter in reverse osmosis systems to remove the chlorine, however more importantly not restrict the flow of water to ensure a good pressure through the membrane of the unit. The Doulton range is the best in this field and is designed to remove bacteria from tank water. It is a 3-stage cartridge with a ceramic outerksin to prevent the passage of bacteria, ecoli etc; a carbon core which has a mix of carbon to remove chlorine and all chemicals, and an ion exchange which has some affinity to copper and heavy metals, as well as removing any residual taste. This cartridge can also be used on mains pressure water. These cartridges are a complete unit. Excellent as fridge filters when they are installed in the line going into the refrigerator. Also when space is limited, as no housing is involved. These include calcium removal and descaling cartridges.